The SJA was delighted to assist when AIPS asked us for candidates to join the Young Reporter programme at the women’s Euros 2017. Maryanne Orr and Katie Mishner were the lucky pair – Katie off the subs’ bench because of illness – and this is an edited version of Katie’s final article, published on the UEFA site. Austria were not the only successful tournament debutants at EURO 2017. 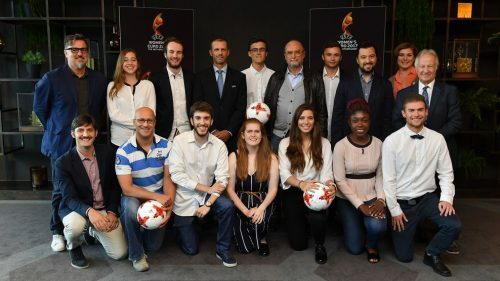 Eleven young reporters from eleven different nations teamed up with UEFA and AIPS, the international sports journalists’ association, for their first major tournament experience – and also made it to the final. AIPS has been developing its unique Young Reporters programme for six years, and this was the third successful venture with UEFA after the European Under-21 tournaments in Israel (2013) and Czech Republic (2015). Alongside learning how to interview or write match reports against deadlines on the job, the young reporters were ‘competing’ with established and experienced journalists in the stadiums. This might have appeared a daunting task, but thanks to the guidance of three mentors – SJA member Keir Radnedge, Martin Mazur and Riccardo Romani – the AIPS Young Reporters learned how to work in a stadium environment, as well as how to explore, develop and practise the key skills required for journalism in the modern era. Days were filled with press conferences, matches and mixed zones. Some of the fledgling journalists had never written a match report before, and all were ready to improve, so the 12 group stage games in the opening 12 days presented a formidable challenge. Being inside the stadium and talking to players was key to obtaining stories – but it was the classes with the mentors that were an important catalyst in helping the budding reporters improve as the tournament progressed. The lectures covered topics such as questioning, preparation and styles, but it was the mentors’ personal insights which truly illustrated what it means to be a successful sports journalist. For example, when explaining how crucial the introduction of an article is, one of the mentors referred to the opening paragraph as being like a first date. Coincidentally, after this session, the quality of introductions improved significantly.